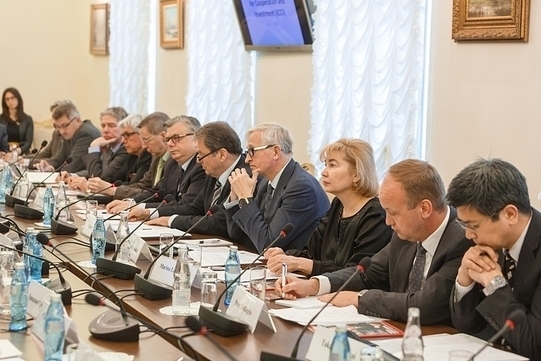 The meeting of the International Council for Cooperation and Investment (ICCI) was held on April 7, 2014 in Moscow. Leading Russian and foreign companies working in Russia, business associations and chambers of commerce participating in ICCI discussed recent political developments related to the Ukrainian crisis and their impact on business activities and investment climate. The meeting was chaired by RSPP President Alexander Shokhin and Chairman of the Association of European Businesses Reiner Hartmann and brought together representatives of about thirty companies and business associations. Participants agreed a statement calling on all governments involved to “commit to diplomatic means and constructive dialogue in order to grant stability and welfare in Europe and the stabilization of Ukraine, thereby restoring confidence of businesses and markets”. They also noted that “threats and imposition of sanctions are counterproductive and contradict [the] goals of achieving economic growth and lifting employment”. Participants also agreed that there is a need for creating a permanent mechanism for consultation and discussion between foreign business and the Russian Government to facilitate improvement of business and investment climate. Further meetings in 2014 will be devoted to harmonization of Russian legislation with OECD standards and creation of the Eurasian Economic Union. The next ICCI meeting will be held in the framework of the St. Petersburg International Economic Forum this May. ICCI is an advisory body established by the Russian Union of Industrialists and Entrepreneurs in 2008 to provide a platform for a dialogue of foreign business and Russian state authorities. ICCI brings together leading foreign investors in Russia, business associations and chambers of commerce.